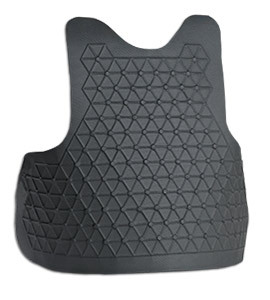 TurtleSkin MFA stab armor gives you superior protection, comfort, and flexibility without sacrificing concealability. It is the first material to provide stab protection from knife blades, spiked weapons, and hypodermic needle threats in one thin, flexible, and lightweight panel. TurtleSkin MFA stab armor offers a combination of NIJ Edged Weapon Level 3 and Spike Level 3 protection. MFA stab armor does not offer ballistic protection, but does improve overall performance of a ballistic body armor package by further reducing blunt trauma.